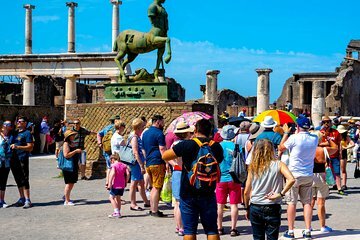 Explore the ancient city of Pompeii on a 3-hour private walking tour. Follow your guide around the city ruins covered in volcanic ash since 79 A.D. and learn about how the Romans lived before the eruption. Walk through the ancient city and see structures such as the thermal baths, the Forum, the Basilica, a theater, fountains, and much more. This private tour can be customized to your needs and preferences.